But, just as Darwin intended, or measured, if two of my senses are shifty, then so shall another be compensated, and for me, it’s sight. Perhaps I’ve convinced myself, but walking through bush, or near ocean, I’ll often spot things; a snake, a bird, that my fellow travelers miss. In such moments, I like to puff my chest, wave my arms and describe the very expression on the fish head in the bird’s beak, as my compadres squint blankly. It makes me feel nobly ancient. But, maybe, in the long-long ago, it’s just that my primal grand-daddy slammed arse backwards into a cave bear while wandering for berries and the subsequent ‘pay attention’ gene kicked in, and it’s not superior sight at all, but survival paranoia. Which brings me to pine forests. Ever since I saw a block of them at the back of the 2nd Hole at the Hamilton Public Golf Course in 1982, they have intoned a very particular, but untraceable emotion in me. That day in the golf course, I feared over-hitting (unlikely, I was a spaz), lest I have to climb the fence and enter the long columns of trees. It felt like something would be waiting for me in there. Something malevolent as it was patient. And yet, I also really, really wanted to climb that fence, and that is a compulsion that has dimmed exactly jot through the years. 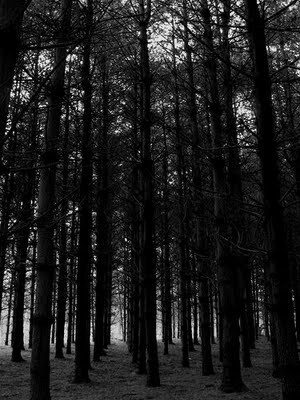 There’s something in the ordered rows of forest, vanishing off into darkness, which swivels my head and heart, always. I’ve tried deconstructing it; using them as a location in a story, but it just reads cheap. I’ve tried photographing and filming them, but the shapes seem lifeless in reproduction. I once had a friend in a seance contact something that informed us of a past life where her and I met in a pine forest in Phoenix and something nasty and unresolved went down. As exhilarating as that experience was, my root being almost always falls back to a kind of supernatural Occam’s Razor. That is, if the choice of explanations is between someone whose hand is on a glass on a ouija board subconsciously pushing it, and a being from another dimension travelling to Keysborough to supply me a cryptic clue, then I’ll go with the former. But pine forests. There they are. Mythical without an origin story. Frightening without logical cause. Calming just because they are. Tall. Dark. Pine forests. No razor, it seems, can slice through this one.